I first met duendita back in August at a dinner party in Brooklyn hosted by the heavenly songstress Jamila Woods. The Williamsburg kitchen was buzzing with talented, beautiful women of colour from across the globe and somehow throughout the night I found myself scooping duendita into hugs like she was some long lost cousin I was so happy to see again at the reunion. Soon after the party I returned to London and searched for her work online. Walking home from the train station one night I pressed play on the video for pray, watching as duendita, dressed in all white and using her parent’s karaoke equipment was backed by a string quartet (also in all white) as they performed the song in her childhood church. ‘pray’ is described as her own ode to joy, a moment to celebrate growing up in Queens, New York, a place she naturally pulls inspiration from because of “its diversity and the different people that live there”. She notes that with over 400 languages being spoken in the borough, she feels as though “if the world was as diverse as Queens it’d be a much greater place” and gives thanks to the area for its effect on her “perspective of the world and how different people can co-exist”. The video for pray opens with rehearsals as duendita fixes her friend’s hair and practices notes. The song starts: “I’m feeling down, I’m feeling low”. I nod along. It continues: “I’d get so high that’s just the way it goes”. I chuckle, #facts. The beat kicks in: “Never forget your place. Try to look up cause the answers are in your face”. I smile, thinking about how true that is. “Never forget to pray. I pray to my God and my mum cause they’re both the same”. I stop the track and wheel it back. I felt a connection to every line in a way that I haven’t felt since Solange’s A Seat at the Table. duendita’s work came into my life at exactly the time I needed it and in some divine, celestial movement of space and time, a couple of weeks after hearing pray she dropped her debut EP. A 10-track wonder named direct line to My Creator. I’ve never considered myself a Music Head™ or someone who even understands the intricacies of instrumentation, but duendita’s music patiently gave me space to hear out the layers of each sound as she twisted, bent and fed her voice around them. Whilst watching her show in London a friend turned to me and noted that “You can really tell that she has studied her craft to work her voice like that”. And it’s true. 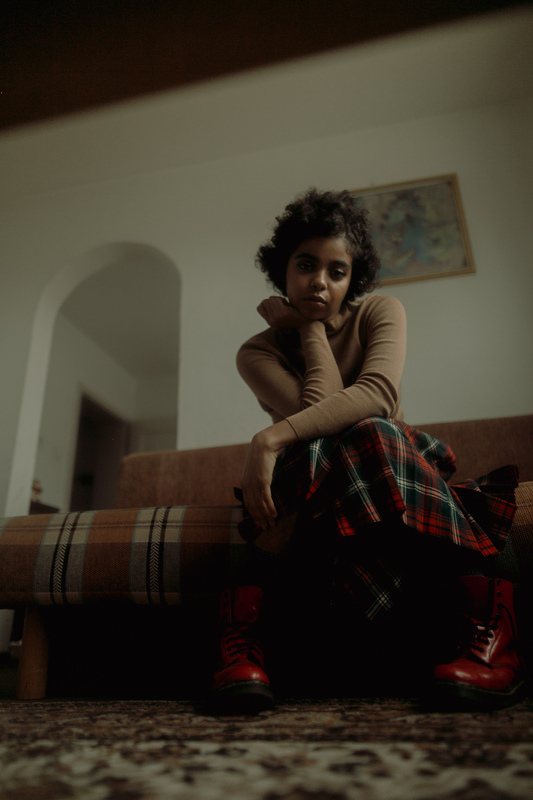 The reason we appreciate the work’s detail so heavily is down to the time duendita and those she works with have put into exploring her vocal range, pouring feelings of hurt and love and wonder into soul filled, intense lyrics and being “open to all the different styles and genres from New York and being influenced by those that pass through New York”. Self-described as “folk music from Queens”, the debut EP was written and recorded over two years. duendita notes that she took time to reflect “on spirituality, dating in a patriarchal society, death and dealing with loss and transcendence and a bunch of other things that come with becoming more aware of the world around you”. She describes how her work orbits around “expressing this innate feeling to love humanity, to love creation, to love the world” and to have conversations with the space around her. Always questioning: “What is this place? Why are we here? Who made it and why does it hurt so much?”. From the weighty, tear-filled “this is for the girls that vanish in the night in blue hands”, to the lovestruck questioning of higher powers on thunder, to documenting everyday activities with her friends across the globe in audio snippets. duendita’s music is like nothing I have ever heard before and yet I feel right at home in it. It’s made me cry in public, wonder deeply about the place I’m in, made me pull my circle closer and fall more in love. In my last moments with duendita in London, I ask her what she hopes people get from her music and in the most perfectly soft, reflective duendita way, she notes, “I hope it brings people joy and a chance to be more vulnerable”, before adding “but also… no pressure”. Listen back to our interview with duendita on Reprezent Radio here. duendita will be playing at Brighton’s The Great Escape in May.